We may be motorcycle accident lawyers, but we’re bikers, first and foremost. As a service to our clients and readers, we’ve put together a list of our favorite biker bars/motorcycle-friendly bars in San Francisco and the Bay Area. In most towns, googling “biker bar” might be a decent way to find a local gin mill, but in San Francisco, you might, shall we say, get a bit more than you bargained for? Never fear: your trusted attorneys at Riderz Law are here to help you out! We’ve taken the guesswork out of finding a decent place to have a drink in SF, and offer the following list of our favorite biker bars in the Bay. We’re always on the lookout for more biker-friendly watering holes, so if you don’t see your favorite on our list, send us an email. If we like your biker bar, we’ll add it to our list. Oh, and this goes without saying but we will anyway: drink responsibly, and never ride while drunk! If you’d like to read our musings on a variety motorcycle topics and news stories, check out our blog. One of the most popular watering holes in SF. Great burgers and one of the best bloody Mary’s in town. Motorcycle friendly. 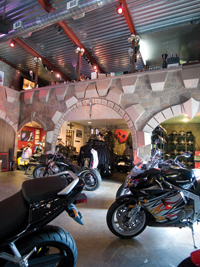 Motorcycle repair shop, café, tattoo parlor, and bar all rolled into one. Great food (breakfast lunch and dinner), a big selection of icy cold beers, and a 150″ plasma TV. Cool biker bar that really caters to riders. They also build and sell custom made street ‘rods. If you’re a biker and you’re in the Bay Area, you need to check out Godspeed . . .
Great British pub in the Mission devoted to bikers and old-school cafe racing. 12 beers on tap and legendary fish and chips. Motorcycle racing is on the TV all day. Always lots of bikes outside. Pub with good food and cold beer. Lots of classic, vintage motorcycles on display – literally hanging from the ceilings. Not so much a biker bar as a museum of classic motorcycles. If you like classic Harley’s, vintage Indian’s, or cool, old-time cafe bikes and cruisers, definitely check it out. Cool dive bar in the city. Full bar and good selection of beers on tap. There’s a great outdoor patio complete with BBQ – the food is awesome. Happy hour till 8pm with cheap drink specials, free popcorn, and canine-friendly, so bring the pooch if you want! What more could you want? Biker friendly. Biker friendly bar in Freemont. Always lots of motorcycles in the lot – especially Sundays. Older crowd. Good live music. Fun biker bar on Haight. Motorcycle parking in front. Tons of great beers on tap. Have fun, but once again: never drink and ride! As always, if you or a loved one have been involved in a motorcycle accident, our San Francisco motorcycle accident lawyers are here to answer any questions you may have. The initial consultation and case evaluation is free, and without obligation.